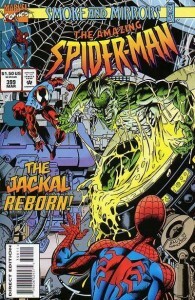 As we approach the fantastic finish of Spider Island (I swear, I’m going to get some write-ups on the remaining three ASM’s just as soon as Marvel’s subscription services department drops the damn things in the mail for me), I’ve been reminded of this mid-90s issue featuring the Jackal and bunch of clones. Now, more than 15 years after this issue first came out, just the sight of it brings a smile to my face, primarily because it serves as a reminder of how often the prognostications of a 13-year-old are woefully inaccurate in hindsight. If you were to ever gain access to my Amazing Spider-Man collection (a laughable concept in its own right), something you’ll find curious is the fact that I actually own two copies of ASM #399. This is intentional. When this issue first came out, I picked it up at my local comic book shop and read it front-to-back during the car ride back to my house. I was so enthralled by the story, so convinced that people would one day look back at this issue as a critical volume in the ASM library, that hours later, I walked to another store that sold comic books and picked up a second copy. 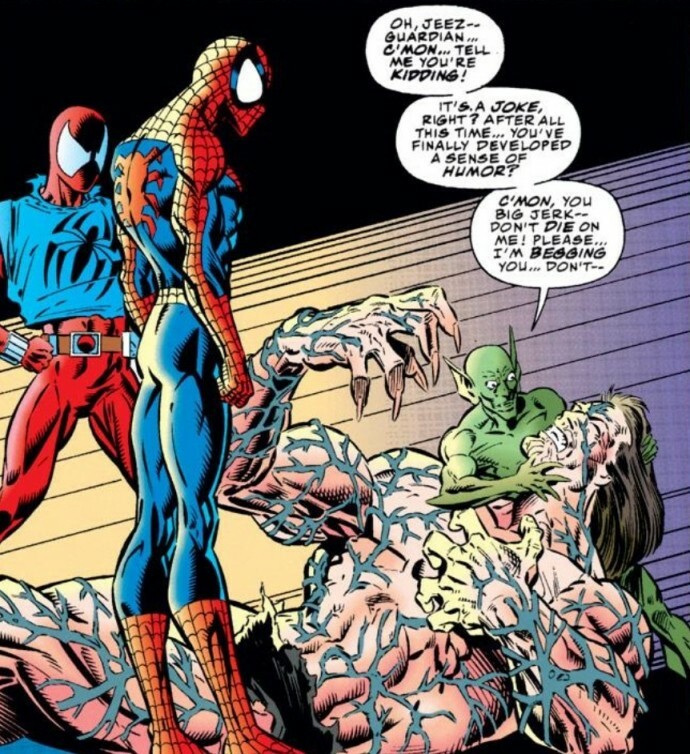 I wasn’t going to be denied from history being made, much-in-the-way that I was when a few years earlier, I carelessly lost and/or destroyed my initial copy of ASM #300. Instead, I never even opened this second copy of #399. I immediately bagged and boarded it for long-term preservation. In an attempt to look back at my 13-year-old self through the lenses of my wiser 30-year-old self, I think there were a couple of reasons why I reacted so strongly to this issue. For one, as I previously discussed on Chasing Amazing, I was super excited about Spider-Man during the lead-up to issue #400, so I think I just got a little carried away in the 400-mania and wanted to grab an extra issue of #399 just so I could get my “fix” of buying and collecting Spidey comics before having my “big” moment one month later. 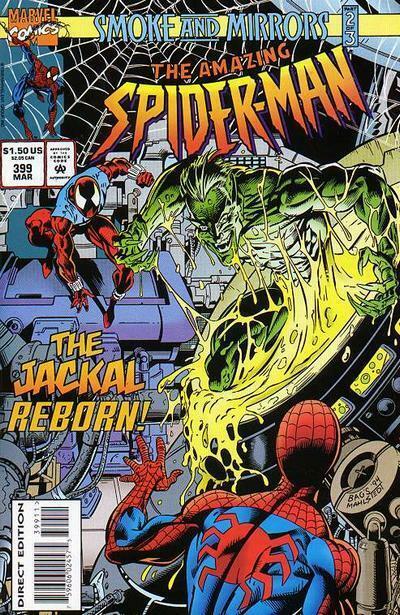 But beyond the #400 angle, I remember also getting caught up by the fact that this issue featured the return of two seemingly forgotten characters: the Jackal – a villain I would later view with derision – and the clone of Peter’s first true love Gwen Stacy. Both of these characters hadn’t appeared in the pages of ASM since the 1970s, so I viewed their returns as some kind of comic book milestone. And since there was such a heavy-duty emphasis on “collectability” throughout the comic book industry during the first half of the 1990s, I gobbled up a second issue in hopes that these “key” reappearances would cause the issue to increase in value exponentially. That, of course, did not happen as a quick check online shows that a Near Mint copy of this issue sells for a whopping $5.49 – actually that’s even a few dollars more than I thought it was worth. Considering I initially paid $1.50 for this comic book, that’s a more than 300 percent return on investment. Maybe I was onto something buying two copies? Either way, I still view this issue as a prime example of youthful (over)exuberance. Obviously, owning two copies of ASM #399 harms no one, and there were probably far worse ways for me to drop $1.50 as 13-year-old, but in retrospect, there is absolutely no legitimate reason for me to still have two copies of this comic book. A few years later, when it was already looking pretty clear that this comic book wasn’t the cultural icon I suspected it would be, I even tried to give this issue away for nothing – my mother was an elementary school teacher and was looking for “prizes” to give her students for an end-of-the-year celebration, so I gave her my extra copy to see if I could maybe help some third grader discover the joys of Spider-Man. And the comic still boomeranged its way back to me. I guess it’s just my destiny to have my two copies.